A drafty and worm-eaten 1930s farm building was saved from the demolition chopping block thanks to a skillful renovation in the hands of Sue Architekten. 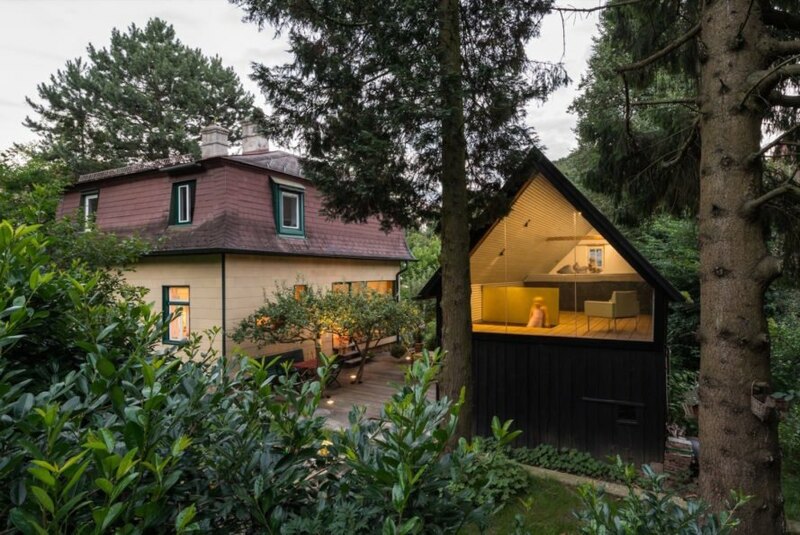 Renamed the Enchanted Shed, this overhauled outbuilding serves as a writer’s workshop, guest room, and “children’s paradise.” The architects gave the Austrian farm building a contemporary new update with a modern interior and a large glazed window that emphasizes the structure’s historic gabled form. 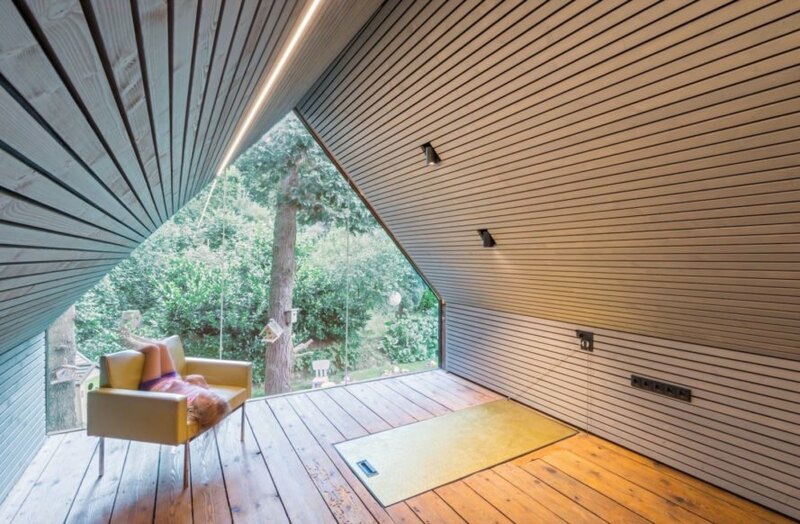 The moss-covered roof and coal tar-covered timber cladding were preserved, however, the architects dramatically transformed the interior with gray varnished spruce planks and a large glazed wall on the front facade of the upper living space. A brass trapdoor separates the top floor from the ground level, which is used for storing miscellaneous items, such as the garden tools and fruit crates. Originally built as a storage shed, the old farm building was one of many that accompanied the Vienna Woods villas back in the 1930s. The moss-covered roof and coal tar-covered timber cladding were preserved, however, the architects dramatically transformed the interior with gray varnished spruce planks and a large glazed wall on the front facade of the upper living space. A brass trapdoor separates the top floor from the ground level, which is used for storing miscellaneous items, such as the garden tools and fruit crates.